Is it Safe to Get a Manicure/Pedicure When Pregnant? Find out if pampering yourself with a mani is okay when you have a bump. When you get pregnant, you suddenly become acutely paranoid of everything you used to do care-free before, and rightfully so. There are lots of foods you’re supposed to avoid when you’re pregnant, and you find yourself stopping to google to make sure activities you used to do before aren’t going to harm you. And that also includes pampering. Even your favorite makeup and cosmetics become questionable when you have a little one growing inside of you. A reader emailed me and asked me the question: is it safe to get a manicure or pedicure when you’re pregnant? I wasn’t sure about this either, but I looked into it, and this is what I found. There is a common belief that getting a pedicure can induce labor. In fact, if you look around online, you’ll see tons of people repeating this. You’ll even find lots of reflexology practitioners who advertise their services to help induce labor for desperate pregnant women. Many women completely believe that this treatment helped them, and that’s awesome. I mean, after you’ve been carrying around a tiny lifeform in your belly for 9 months, you’re just about willing to try anything. The fact is that there have been very few studies on this subject, and I actually couldn’t find a single trustworthy source that says whether or not pedicures or accupressure can induce labor. A 2015 study of 132 women with late pregnancy (over 41 weeks) concluded that accupressure had no effect in inducing labor. A 2013 study of 156 women concluded that manipulating the SP6 pressure point (in the ankle) did prove to be effective as a means to induce labor. Finally, this 2014 study concluded that the studies done to date that prove the effectiveness of accupressure in labor and birth may be misleading. If you know me, you know I’m something of a skeptic. I find it hard to believe that simply rubbing on the feet and ankles could cause you to go into labor. But having said that, there is no hard evidence that it doesn’t work. On the contrary: there are tons and tons of women who truly believe that it works. So, my conclusion is this: make your own decision. I can’t tell you whether or not getting a pedicure is going to cause you to go into labor. If you’re ready and aching to get it over with, go ahead and try it! But there’s no scientific evidence to prove that they’re effective in inducing labor. 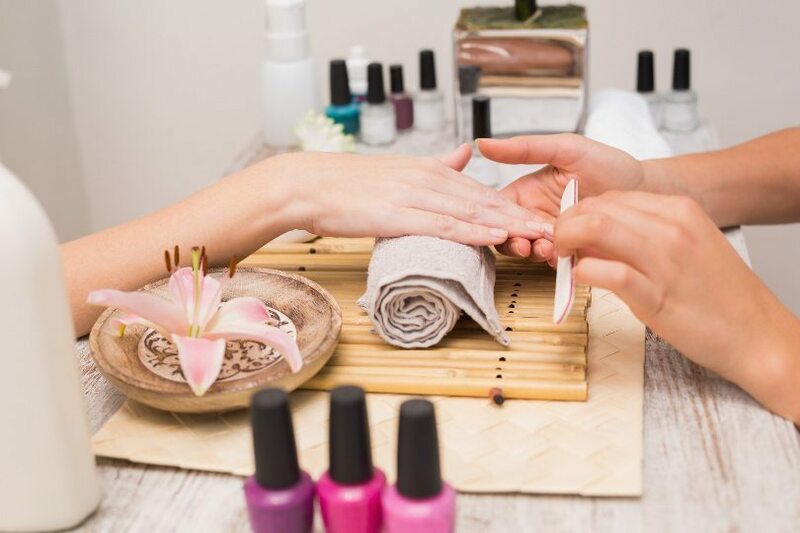 Steps to staying safe when getting a manicure or pedicure. Having said all of this, there is more to the question of whether or not pedicures are safe during pregnancy than just the risk of inducing labor. If you’ve ever been to a nail salon, you know that they use a lot of chemicals. The manicurists & pedicurists often wear masks, so that should tell you something. Hygiene is also a concern, but you can make sure it’s not going to be a problem. Personally, I’m pretty concerned about chemical stench you smell when you walk by a mall nail salon, and I’d avoid them. Make sure the area is well-ventilated. Even if chemicals aren’t being used on you, they probably are on the other patrons of the salon. If you step into the salon and it reeks of chemicals, forget it. Go somewhere else. You need fresh air, not just a fan blowing in the room. Look for open windows, and actually ask them if their salon is ventilated or not. The strong chemical smell can easily induce a quick onset of nausea, which is a good way to ruin your well-deserved pampering session. Don’t eat anything while at the salon. Supposedly, if there are chemicals in the air, you’ll end up consuming them along with the food. Look online for the salon’s health inspection record. Thankfully, health inspection records are usually publicly available on the internet. Just google something like “(name of salon) health inspection” and you’ll likely find it. Ask which chemicals are going to be used. There are a whole wack of different chemicals that are used in salons, and you can look up the specific ones to make sure there is no risk to you. Bring your own files and nail clippers. This might seem excessive, but it will insure there’s no risk of passing on an infection or fungus (yes, it happens). Go first thing in the morning. This will insure the least chance of getting an infection, because everything should be freshly cleaned and ready to go for you. Don’t go if you have broken skin on your hands or feet. This is for the same reasons as above: to avoid infections. Don’t get a manicure or pedicure in the first trimester. If you’re going to get one of these treatments done, at least wait until the second trimester to do so. The risk associated with the chemicals is higher in the first trimester. Most importantly of all, ask your doctor beforehand. Any type of beauty treatment involving rubbing of the feet or chemicals should be okay’d by a medical professional beforehand just to be safe. What about working in a nail salon when I’m pregnant? If you’re actually employed at a nail salon, all of this goes out the window. I really don’t think the constant exposure to all of the chemicals is either safe or a good idea when you’re a pregnant woman. If you work at one of these salons, I’d seriously consider taking a leave of absence. It’s just not worth the risk. Great article. Another bonus of getting there in the morning: chance of less fumes. I’m on your side though – I avoid the stinky places (even when I’m not expecting).